Tagged under Yoshihiro Togashi, Madhouse, Nippon Animation, Series, Light Novel. Gon was just a boy who lived in a world where one of the most dangerous professions is a hunter. Many people aspire to be hunters but few are able to prevail over the numerous trials and ultimately succeed. During a chance encounter with a mysterious man Gon discovered that his father is one of the most exemplary hunters, with his fame and reputation spreading far and wide. Unfortunately, his father had abandoned him at an early age and his whereabouts remain unknown. The only clue he left behind is a picture and stories about his exploits. Thus begins Gon's quest to become a Hunter and ultimately, find his father. Along the perilous road he meets Leorio, a slacker with an inclination to medicine; Kurapika, who is myterious and aloof; and a young boy of about his age, Killua, a member of an elite assassin family. Together, they embark to face challenges to realize their shared dream of being a Hunter. What dangers lie ahead in this dangerous and cruel reality in which secrets are protected with lives, and dreams are the pathway to peril? The anime is very interesting though. 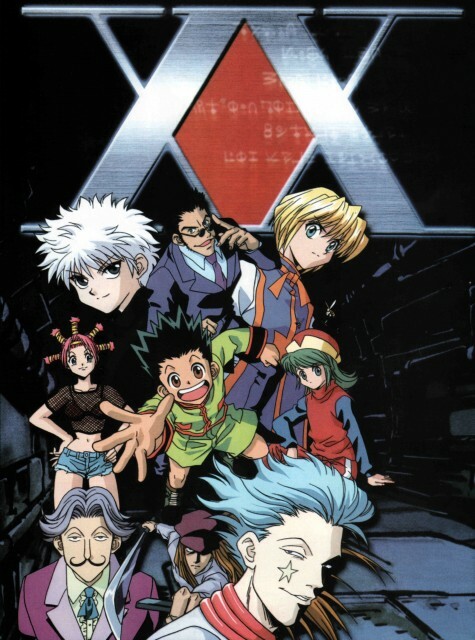 I love this anime since I was a kid, I remember I always wanted to be a hunter , too bad it's ended, but it was awesome ending, I liked all the seasons except the Ants Arc I didn't liked it at all (I liked only the duels between Komoge and the king and the ending of the arc, it's sad , but it was great ending), any way, my favorite character is Killua, OMG!! I love him very very very very much!!!! Such a cute little kitty!! I hope in the future it will be a continuation to the anime cause the style of hunters is very cool and enjoyable. this anime has some of the best written characters in the whole industry along with a great story too. lots of action, gore, suspense and all the good stuff a shonen anime can offer. hmm, i got a lot of things to say about hunter x hunter, first i loved the anime since i was little, and when i grew up i wished if it gonna be reanimaited, and the wish came true but i got sad when i heard the anime will stop, i wish it will return soon, because a lot of thing remain mystery in the anime, like what will happen to kurapika and kurollo?, and what will gon and killua will do next? are they even stay together? it seems that maybe they will be departed from each other, i want to know this if the anime will back, any way i like the anime style, about hunting, chasing, challenging, even you r not a kid you will enjoy it, second the characters, i like the main characters, like my favorite character Killua (he's like a little cat>3<), hisoka, gon, palm, meruem and komogi, i don't like the side characters design, they draw them very ugly, (the worst character i saw in the anime is nitero ), and the music of the anime is so original and special, though i don't like the op songs, and all the arcs of the anime is great except the chimera ant arc, i didn't like it, all i like is the king and komogi duels, i didn't like the whole idea about kaito and gon dying to save him, it's all so unnecessary, still we had to see it if we want to finish the story, anyway nice anime i liked it and i enjoy watching it though i want to know the rest of the story about genie ryodan story and Kurapika revenge, so sad it had to end so soon. This has a DBZ feel to it, but is so much better than that series. The characters feel more developed and the story arcs are more intriguing. The master roshi character is just as playful, but also appears more disciplined and respected. Interesting creative dynamics, such as Greed Island, playout and allow the characters and readers to explore this manga universe further. Hope more of this is made. Waaaa! Another case of not finishing the series in anime format! Cool anime, but too drawn out in some parts. The 2011 remake has been great so far. Unlike the original it doesn't drag on in certain parts. looking forward to arcs after greed island! Now, however, following the rather common trend of new old-anime for the new generation, we have a new somewhat compressed Hunter x Hunter series which I'm following right now, with all-new animation, voice actors, studio & eye colours. And regardless of my general dislike of the "they did it why don't we" system, I cannot complain when it comes to anime(not quite often, at least); after all who wouldn't want more of a good thing? As for the HxH 2011, it seems rather good so far, but it's too early to form a definite opinion. I guess I'll keep watching while hoping that Yoshihiro Togashi would, if he pleases, keep the chapters coming.. so until the HxH 2012 episodes are safely aired, I'm keeping my fingers crossed.. I'm being overly biased here for giving it a perfect score, but then again, it's the same with all my ultimate favorites. Anyway, Hunter X Hunter has two main points that kept it interesting and going. First: its plot. There are many anime that are action-themed, but Hunter X Hunter takes the cake. While other series have more dialog during action scenes, this series are packed with more of the actual action. The duels are not simple roundhouse fighting but can be treated as realistic ones; not too gory but depicts a punch as a punch. The adrenaline you feel from watching the beginning of an arc last through the entirety of it, and the excitement only doubles during the following arc. The second point is its characters. While Gon may pass as a Gary Sue in terms of attitude and way of thinking, that is, by no means, a reason not to like him. He's one of your typical yet extraordinary boys, and his relationship with Killua is a perfect point. Killua is easily the best character in the series, with his very interesting background and attitude. There's never a dull moment in the series with him around. Kurapika, on the other hand, captivates you with his drive for revenge, and the last arc of the series and the OVA highlights it all. The rest of the cast provides a variety of simplistic entertainment, but that's what's great of it. Hunter x Hunter isn't a ground-breaking masterpiece. It's not going to shock you with the ingenuity of its plot, its art is simple, and upon first watching or reading it, you can bet it'll feel familiar. The series is shonen, pure and simple. It's exactly what you'd expect of the genre--which is why it gets a ten. Hunter x Hunter is a perfect example of what it is. While the series definitely needs more love, it isn't going to be for everyone. It's kind of like playing the original Pac Man instead of an updated version with better graphics and new features. You don't play it for the thrill. You play it 'cause it's the original Pac Man and you friggin' love it. *laughs* Maybe it's so bad it's good. Maybe you don't like all the shiny additions on the update. Maybe you remember playing Pac Man when you were younger and feel like reliving ye olde days. XD Who the heck knows. There's just some mysterious draw that these ultra!simple things , whether game or anime, have. The characters are simply adorable. Sure, they're all pretty archetypal, but, they're archetypal in the best possible way. Even though I can think of a dozen or more similar characters off the top of my head, the cast of Hunter x Hunter manages to stand out. While some accomplish this better than others, not a one fails to come to life. Special shout-outs to Killua for being incredibly well done. Characters with his sort of backstory usually feel the need to repent or avoid killing. He doesn't. Killing is an art, and life-threatening challenges are games. He doesn't even have problems encouraging people, working with a group, or socialising. There's something certifiably and gloriously cracked about his mental state--I love it. Characters outside of the leads are interesting and well-defined, too. A rarity in the genre. Both the animation and music fail to stand out. They're neither bad nor good. The opening theme is cute, and fits the series perfectly, but isn't the sort of thing I'd seek out for the sole purpose of hearing. Expect the typical multi-episode trials, but don't count on them to be dull. At the end of each episode, I'm always wanting to watch more. It's a fun series that just makes you smile. That, more than anything, deserves a ten.